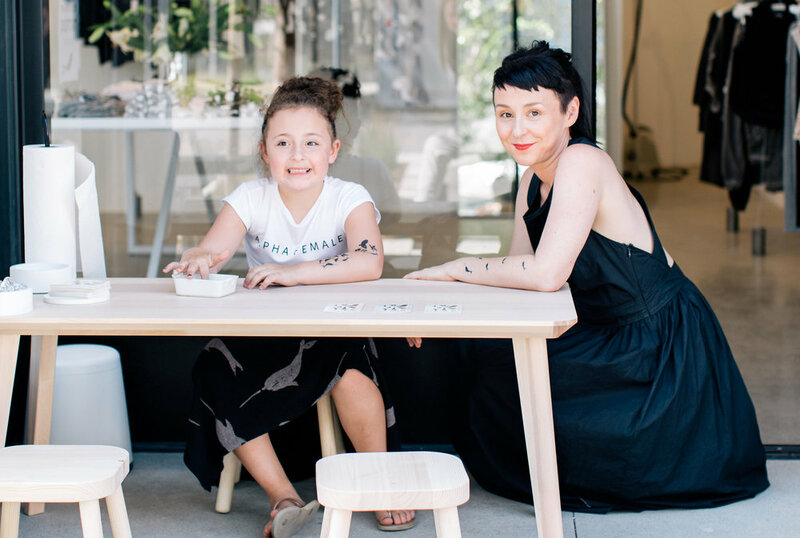 Considering the fact that you can currently shop cool, LA-made kids brand OMAMImini in retailers including Barneys and Fred Segal besides its very own flagship store in Los Angeles' buzzed-about concept shopping center Row DTLA, it's a bit hard to believe that just five years ago, the brand's founder — admittedly — had no idea what she was doing. Ola Omami, who partnered with art director Natasha Mileshina to create the line, previously worked as a product designer and maintained a popular design-based blog before realizing that she longed for a more creative, hands-on project. When she became pregnant with daughter Eva, Ola noticed that the majority of girls clothing on the market didn't speak to her: either it was pink and decorated with bows and sparkles, or black and covered in skulls. Eventually that frustration manifested itself into OMAMImini — once described by a customer as "Rick Owens for babies" if that gives a visual of the brand's aesthetic — which launched five years ago. Impressed with the growth of a business that was completely out of her comfort zone, we wanted to learn more about Ola's career path, including the biggest lesson she's learned thus far and the style inspiration behind her brand. I usually say it happened because I couldn’t find clothes for my daughter that I really liked back when I was pregnant. It's much better now, but back then every baby department for girls had 50 shades of pink and nothing else. As an alternative, there were some brands that offered all black onesies with skulls, which was not my style either. I complained about it to a friend of mine, who happened to be fashion designer, and she said “you should just start our own line. I can totally see it: clean, sophisticated, minimal, Jil Sander for babies.” This sounded completely unrealistic at the time, but the idea got stuck in my head and eventually it happened. That’s the short version, but there’s also another reason that I don’t mention much: it’s less practical but still very related to the fact I had a daughter. Before her, I was certain that children wouldn’t change me. But having a child does change you and my life is very different now, though not in a way I was afraid it might. It gave me the opportunity to rethink my priorities and do something that really gives my life a sense of purpose. Stylistically, what inspired the line? I love Louise Bourgeois’ quote “Art is a guarantee of sanity.” I believe it includes applied arts as well, and design in particular. Art, design, and all things effortlessly beautiful make (my) life bearable and there’s just ever enough of it. Our clothes are intended for parents who share our sense of style, and beyond practical it should really make their lives more content. I mean, if you like all things neat, gray, black and white, chances are it won’t make you happy seeing your child wearing some purple sparkly extravaganza. Some people say it's not important, but being the OCD that I am, everything — every detail of my surroundings — is important. I have to constantly keep in mind that it’s a relatively narrow niche. It’s often tempting to add more details or to make the prints cuter, since I know it might appeal to wider audience. Then I remind myself why I started this brand. Another important measure is to make sure I’d be perfectly happy to wear every single piece myself, because parents shouldn’t compromise and adjust their aesthetics when choosing wardrobe for their children. Is Eva into fashion? What's her style? She's very much into fashion and art and wants to be an artist when she grows up. She'll often ask for my advice or help when dressing up, but we don't always see eye to eye about some outfits. Her style is a bit more eclectic and elaborate than I would like but she's getting into color coordination and wants to match me, so it gets easier. We had a bumpy patch around age 5, when she became obsessed with pink and I hated it but, thankfully she's absolutely over it. Not long ago she was at a playdate and I got a text that said, "We're playing with Playdough and Eva is explaining that there are no boys or girls colors and that all colors are great and boys and girls are equally awesome." It was so touching and comforting to get this reassurance I'm doing something right in parenting just through her clothes. As an essentially unexpected fashion entrepreneur, what's been the most surprising lesson of starting your own business? Once you start challenging yourself and doing things outside of your comfort zone, there's a good chance you'll become a whole different person. I used to be this super shy, introverted person who was extremely uncomfortable with any type of face-to-face or over the phone interaction with strangers. In the beginning it was hard to even pick up the phone and call suppliers or attend trade show. I would literally be on a verge of anxiety attack before every single show for the first couple of years. But the more you "fake it," the easier it gets and eventually you find yourself not faking anymore and you realize you actually know how to do this and are maybe even somewhat good at it. Fashion Mamas LA Turns Three!